How is a volleyball court constructed? Volleyball courts are sports facilities with artificial flooring which are enclosed by wire mesh. Considering the health of the players, the volleyball should be played on the proper floors. Successful works should be carried out to reveal the difference in the field of constructing both outdoor and indoor volleyball courts. We offer rubber flooring (tartan floors) and acrylic flooring for the volleyball courts. PU floors are preferred for indoor courts. We can also successfully apply any color to the flooring. Applications on asphalt and concrete surface are two different options for the volleyball court construction. Volleyball courts are constructed in 4 main stages. The works start with infrastructure works, then continue with wire mesh works and finally, it is completed with the installation of flooring. The stirrup concrete is poured and the anchorages are placed at first. Subsequently, helicopter concrete or asphalt of 10 cm thickness is applied on the ground. Iron pipes with the height of 4 m are welded to the anchorages. At least three layers of pipes are welded parallel to each other horizontally between these poles. PVC coated wire mesh with a mesh size of 5cm x 5cm is installed on the frame. Lighting is connected to the main poles in line with the customer’s request. 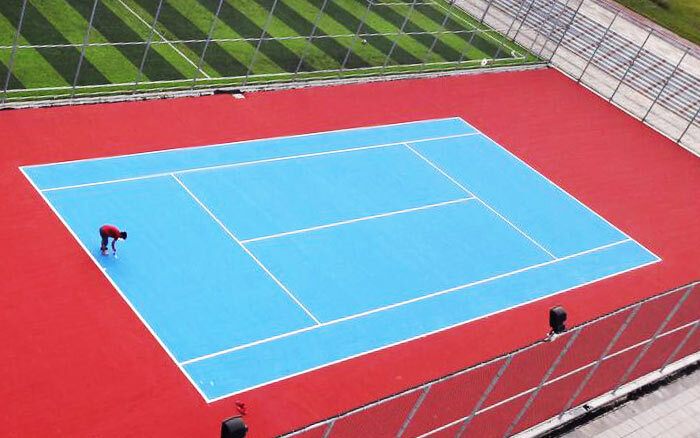 Acrylic floor or tartan floor can be applied as artificial flooring at outdoor courts. 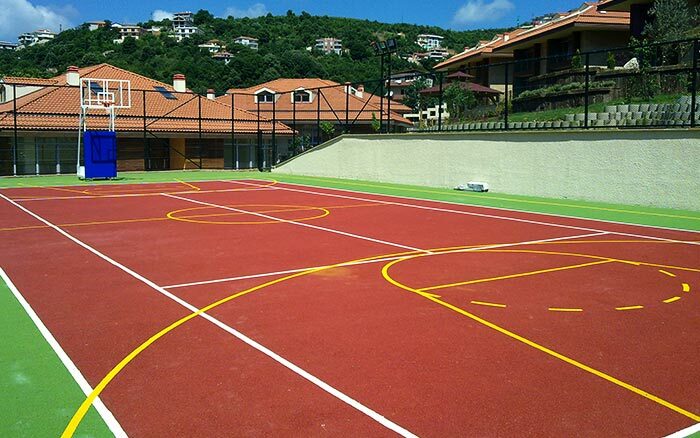 PVC sports flooring (PU) is used for indoor courts. We can also apply wooden parquet sports systems for indoor sports halls. The work is finished by installing the volleyball poles and net. What is the Cost of Volleyball Court Construction? Volleyball court construction cost varies depending on many factors. The dimensions of the court is the first criterion for this issue. Then the cost is determined based on the characteristics of artificial flooring material to be used. The dimensions should also be considered during the construction stages of the volleyball court. The dimensions of 9 meters by 18 meters are the most ideal ones. However, mini-size volleyball courts are also available. The dimensions of 6 meters by 12 meters might be a proper option for those who have small spaces. Get the price of volleyball court construction and installation of volleyball flooring types.